ELEVATION: 4100 Ft. / 3769 Ft. PARKING: Parking can be found at Lafayette Place campground on either side of route 93. There is a underground tunnel walkway providing access to parking lots on both sides of the highway. DESCRIPTION: From Lafayette Place Campground follow the campground road to the back of the campground and look for the Lonesome Lake Trail Kiosk. The Lonesome Lake Trail begins a gradual ascent through a hardwood forest. After 0.4 Miles you encounter the Hi-Cannon Trail junction. The Hi-Cannon Trail is moderately overgrown, the trail is easy to recognize and follow however hardwood and spruce branches will rub against your shoulders. It is a 1.1 mile brutally steep ascent featuring switchbacks and rickety wooden ladders eventually joining the Kinsman Ridge Trail. 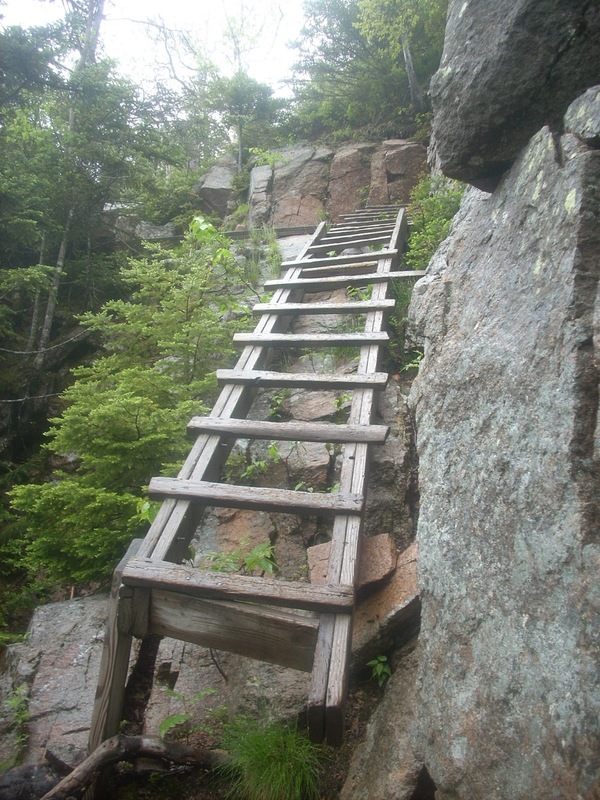 The Cannon Mountain summit is 0.4 miles to the North over moderate and rocky terrain. The Summit is marked with a lookout tower and offers spectacular panoramic views of Franconia Ridge to the East and the Kinsman Mountains to the southwest. Descend the Kinsman Ridge Trail South back to the Hi-Cannon Trail junction but continue a steep descent along Kinsman Ridge 0.3 Miles to the Lonesome Lake Trail. 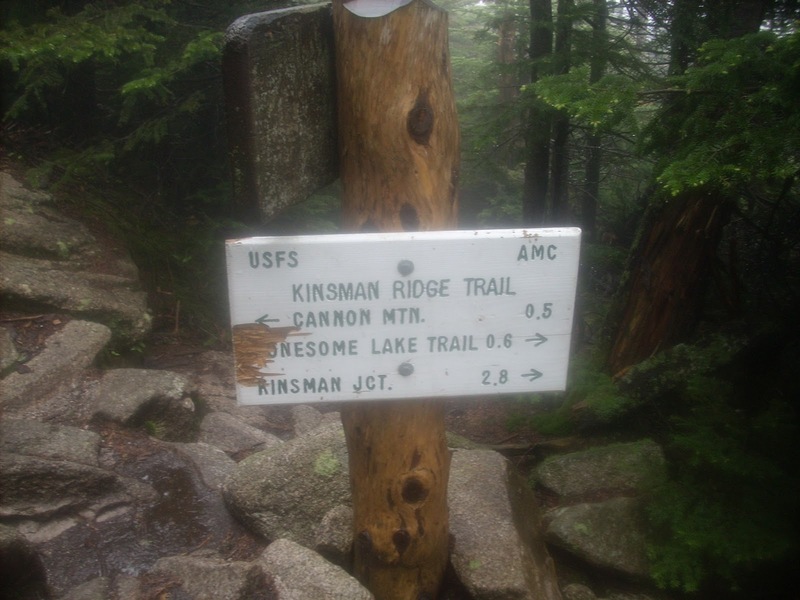 Northeast Cannon Ball is a short 0.2 Mile pitch along Kinsman Ridge or descend the Lonesome Lake trail over a rocky terrain 1.1 Miles to Lonesome Lake. Continue along easy terrain around the lake and descend the Lonesome lake Trail 0.8 Miles which begins gradually but the descent pitch increases as you make your way back to the Hi-Cannon Trail Junction. From here it's a short 0.4 mile trip over easy terrain back to Lafayette Place Campground. NOTES / COMMENTS: Cannon Mountain is a popular hike and one of the 48 Four-thousand Foot peaks in New Hampshire. Northeast Cannon ball at 3769 Ft. is the 99h mountain on the AMC list of New England 100 highest. The overcast weather and ominous clouds had me worried about getting caught in a summer thunderstorm and I really increased my pace. Cannon is typically a popular locations amongst hikers and you will rarely find the summit area isolated. A sign marking the Hi-Canon / Kinsman Ridge Trail junction. 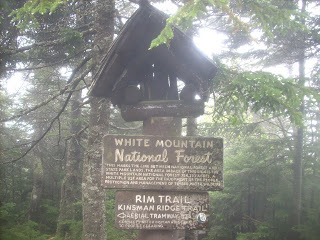 This sign marks the boundary between White Mountain National Forest land and Franconia Notch State Park lands. Foss Mountain - 1657 Ft.
Nahor Hill - Antrim - 1170 Ft.
Campbell Hill - Hooksett - 605 Ft.
Whitewall Mtn. - 3405 Ft.
Chester NH higpoint - 639 Ft.
Dunbarton High Point - 925 Ft.
Mt. Kearsarge - 2937 Ft.
Dumplingtown Hill - 525 Ft.
Jeremy Hill - 575 Ft.